Let's get one thing out of the way first. I do not think much of those new titles and the changes to the theme music. There, I've said it. Much as I love Murray Gold, and his work on The Eleventh Hour has some gorgeous new themes for the Doctor and Amy all whizzed up with echoes of everything from The End Of Time to The Runaway Bride, I'm not entirely sure his funked up version of Ron Grainer's original tune works. Its revisionism bends the instantly recognisable theme rather alarmingly out of shape and then has a few tokenistic Delia bits chucked in as a bit of reassurance. The strangeness, which is the entire point of the Doctor Who theme, is tucked behind what sounds like an entirely new bit that Grainer didn't compose before being drowned in booming choirs and skipping drum beats. The other problem is the title sequence itself. 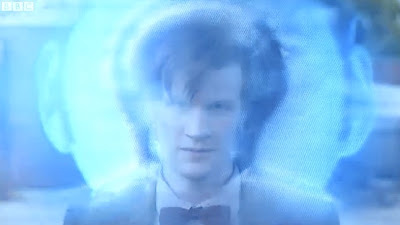 If this is the vortex the TARDIS is travelling through then mix me a Manhattan and call me Sally. There just isn't a real sense of travelling into the unknown here. It just feels like you've run into a bit of turbulence amongst some very pretty cumulonimbus. As ever with major changes to Doctor Who, we can't all like everything. Never mind, I'll just have to put up with it. It might even grow on me. Forget the branding bookends then and dive right in to a Doctor Who that gleefully plays with how you think the series works post 2005 but then spectacularly wrong foots you with giddy and witty scripting, an instantly charismatic Doctor and an equally attractive companion in Amy. Not since Tom Baker skipped on the spot with Ian Marter in Robot have we had an actor who so physically owns the role. Big, gangly Matt Smith is a fireball of sheer presence and simply commands you to watch him. You can see precisely why Moffat cast him and in this opening 65 minutes his faith has been rewarded. It truly is an amazing performance, is quixotic and mercurial but packed with enormous subtlety and naturalism too. Whilst many things may seem familiar to us - the pre-titles of the TARDIS descent, zooming in from space and into the skies of London quotes many of RTD's season openers and specials, particularly the 2005 re-launch Rose, the video conferencing with the world's boffins, the transmitted computer virus displayed across various world locations - much has been swept away. 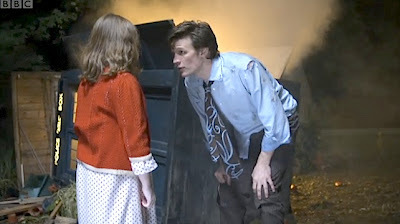 RTD's penchant for foregrounding the melodramatic, soap elements of the companions immediate families - the Tylers, the Joneses, the Nobles - before the Doctor Who stuff, is replaced here by the story of a young, orphaned girl with an imaginary friend. A girl who waits 14 years to finally fulfill her dreams of adventure. What Moffat does is replace the private emotional power of families and relatives, the now rather worn out romantic desires of the companion for the Doctor and his exploits, with a story of how a woman grows up and sadly disconnects from her own inner child. He's interested in the inner fantasy lives of children, something he has thematically exploited in his earlier episodes with specific childhood scares - the monster under the bed, the monster creeping up behind you - and shows young Amy's fantasy role playing of adventures with the raggedy Doctor. Her stories, drawings and dolls, so much like those created by any child that's watching who writes and acts out their own adventures with the Doctor, become sublimated into an adult life where the yearning for such adventure still exists but hasn't been acted upon. No wonder she likes dressing up and kissing people for a living. As fans we live our fantasy lives out vicariously through figures such as the Doctor and from a very young age I'm sure many of us wanted that TARDIS to land in our own back gardens. Moffat's simply taken that notion and created Amy Pond, a reckless, independent and opinionated woman and embodied her as a more traditional kind of companion. What's also interesting here is that Amy has shared these stories and ideas of the Doctor so that it becomes a folk myth of the Raggedy Doctor, a child's tale that her friends have shared in. Note how embarrassed she gets when Mrs. Angelo mentions the cartoons! To embrace the child-like, to rediscover it in yourself, to get back to the essence of your being is one of the main themes here whether it is the Doctor eating fishfingers and custard in Amy's kitchen, Amy remembering apples with faces or the Doctor and the TARDIS getting a facelift. There's a youthful swagger in the new Doctor that reminds you of Tennant's first year in the role until he got bogged down with all the loneliness and angst. The childhood scares are still there too with the crack in a bedroom wall ushering in some 'corner of your eye' creepiness that's classic Moffat. 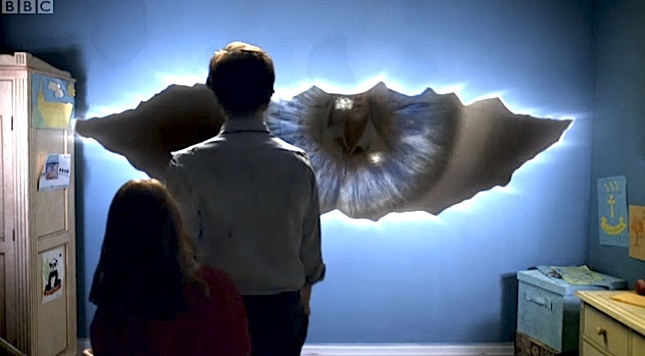 The big eyeball beadily observing the Doctor from the crack in the wall and later from the centre of a spaceship is a lovely surreal touch that visually announces the series new 'fairy tale' fantasy credentials. And fairy tales are all about showing children what to be scared of, including an alien who can't quite get the hang of possession as we see in some bizarre scenes where you can have a dog and bark yourself and where Olivia Coleman and the two girls put a wonderfully scary spin on the mother and daughter relationship. We still have a boyfriend lurking in the background, with Rory being a sort of substitute for the Doctor who didn't quite rise to the challenge and became the literal opposite, a nurse. Whether that relationship with Amy will develop in this series is debatable. Arthur Darvill made a decent show of quite a low-key role in the episode and I look forward to his return later in the season. We have also yet to discover who Amy was going to marry before hopping aboard the TARDIS. In effect, the story reflects some of the themes of The Girl In The Fireplace but places the emphasis elsewhere. Madame Du Pompadour and the Doctor conduct a romance over decades wherein the erratic nature of time travel leads to the Doctor's own sadness and disappointment. Here, the Doctor's gone so long after making a vivid impression on the young Amy the effect is to engender a fearlessness in a young woman born out of cynicism and disappointment. A rather interesting dynamic and one that the Doctor sees as a challenge when Amy enters the TARDIS and reluctantly agrees to the trip. "You wanted to come 14 years ago" he says. "I grew up," Amy responds. "Don't worry, I'll soon fix that." Just as every Saturday for the next 13 weeks he'll fix it for us too. The Eleventh Hour also sets up a theme for the season too with the Face Tendril alien warning ominously that the 'Pandorica will open and silence will fall' as the Doctor cockily sends it back into the clutches of its Atraxi jailor. 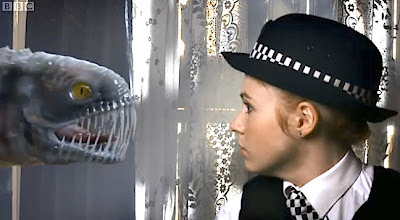 The alien threat, whilst interesting, is not really the point of the episode beyond offering something to test the mettle of a newly formed Doctor and reassure us and the Atraxi that this is indeed the same man with a quick rummage in their data banks to show us the previous ten faces of the Doctor and a collection of foes old and new. It's brilliantly done with Matt Smith then bursting through at the end of the sequence, shattering the final face, that of Tennant, triumphantly restored as the Doctor. It's only problem, apart from the titles, is it might be a shade too long. A beautifully funny script, packed with great lines ("You're Scottish - fry something." "Patrick Moore? I'll get you his number, but watch him, he's a devil!'") simply rattles along but interesting as director Adam Smith's techniques are I just thought the Doctor's mind's eye sequence didn't quite work. It makes the point well enough that the Doctor never misses the detail, and it's a brave effort to do something that little bit different, but I hope it's something that isn't repeated throughout the forthcoming episodes because it'll become very annoying, very quickly. Adam Smith acquits himself far better in the whole of the opening half with the young Amy, played with utter charm by Caitlin Blackwood, and the entire sequence of the Doctor trying various items of food is edited and scored to perfection and has that wonderful reverse in the comedy of the situation when the Doctor concludes that Amy is very brave but it "must be a hell of a scary crack in your wall" considering she's sat in the kitchen, in the middle of the night, with a total stranger who's eating fish fingers and custard. Equally lovely is Amy's entrance into the TARDIS, with Karen very cleverly providing Amy's wide-eyed wonder under a bluff, no nonsense 'too cool for school' attitude. Again, it's well directed, with both Smith the director and Smith the actor bouncing around the new TARDIS with abandon and it's beautifully scored by Gold. So it's "goodbye, Leadworth and hello, everything" as the TARDIS hurtles off with Amy and one of the most assured acting debuts in Matt Smith's Doctor. His confidence as "the madman and his box" and Karen's welcome and rather atypical portrayal of Amy is more than enough to push the series off on its new trajectory. The Eleventh Hour works perfectly well as an opener, containing some of best moments of Doctor Who in years, but I'm convinced that the very best really is yet to come. and is also available on Amazon. A very good review of an excellent episode. Apart from the opening titles, I enjoyed it immensley, and Smith is a great doctor. I really enjoyed that episode apart from my personal niggles about the titles and music. Matt's debut is so assured here and must silence the naysayers who thought he was too young for the role. And Karen is lovely and makes Amy so different from the previous companions post 2005. I think we're in for a treat in the next 13 weeks! did strike me as a little dodgy. made such a scary alien? was an excellent Doctor debut story. Roll on the 2010 season! Oh, I'm so glad other people had a problem with the titles and the music. I was actually hoping Murray Gold would be sent packing with RTD, Julie and David, as his intrusive attitude just gets on my nerves. There were actually moments during the original broadcast of "Silence in the Library"/"Forest of the Dead" in which I couldn't hear the dialogue! Same with "The Waters of Mars". Anyway, Gold rant over. 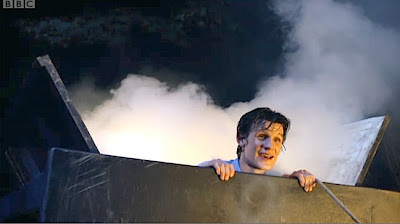 Loved the episode, love Matt Smith, like the Eleventh Doctor, and very fond of Amy Pond. The naysayers were always going to have a problem: it's part of their nature. As ever, a brilliant piece of analysis. We are going to have an exceptional 27 episodes with Moffat, Smith and Gillan at the helm of our show. This episode sets the bar so high already and the coming soon section made it feel like it will deliver. "Not since Tom Baker skipped on the spot with Ian Marter in Robot have we had an actor who so physically owns the role." What's most interesting to me on second viewing, however, is the cinematography. Lots and lots and LOTS of depth of field effect, particularly noticeable in the HD version. I don't think Tennant had so much of that, and while we're on the topic the lighting in this thing was just WOW throughout. Flawless. So it turns out, I read elsewhere, that Matt's mum is a massive DW fan, specifically of Troughton. Explains much. I definitely saw that in Smith's approach, along with a fair bit of Davison and (as befits this episode) some direct and indirect Tennant. Oh, and somewhere Douglas Adams is smiling, that much is sure. As for the titles and theme: I'm even more down on it than you are. Won't say "hated it," might let the theme tune grow on me, but the title sequence (sponsored by the Weather Channel) is (I'm sorry) utter FAIL. Overall, it's a great "new Doctor story." Next week, however, is the real test. Isn't it always? PS. Look at that shot you posted of Matt appearing over the ruined TARDIS and tell me that's not Michael Palin. HA! What a lovely write-up, Mr Frank sir. Thankyou. 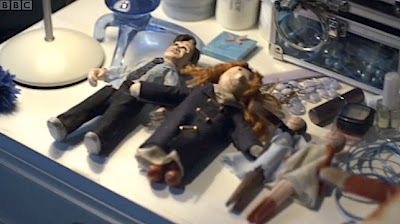 "Adam Smith acquits himself far better in the whole of the opening half with the young Amy, played with utter charm by Caitlin Blackwood, and the entire sequence of the Doctor trying various items of food is edited and scored to perfection and has that wonderful reverse in the comedy of the situation when the Doctor concludes that Amy is very brave but it "must be a hell of a scary crack in your wall" considering she's sat in the kitchen, in the middle of the night, with a total stranger who's eating fish fingers and custard." Really insightful review as always (I love your blog!). Wonderful episode: I liked the concept of the virus created to communicate to the Atraxi - 'reset' everything to zero - also works as an implicit comment on the 'all new' nature of the new Who set-up? chas_m, thank you so much for those comments. I'm so glad you brought up the cinematography on this episode. It's something I too noticed. Lovely use of deep focus and lighting and it makes the series look so much better and very cinematic. There is a lot of stuff in that episode that quite frankly suggests something much darker going on under the surface and Moffat has indicated this in his last column for DWM. Amy and the Doctor play a game of bluff with each other and the scanner screen on the TARDIS indicates that the Doctor is aware that something is up and that he can't tell Amy. And why does he purposefully go back and collect her? She's important to the whole crack in the universe plot I betcha! Sarah and Tim - again thanks! Like that notion of yours Sarah that the computer virus that sets everything to zero is a perfect metaphor that indicates that Moffat is also setting the series to zero! Brilliant. Hi Frank, like you I wasn't raving about the theme tune - sounds like distortion has been introduced. I thought that there were lots of references to Spearhead from Space which was nice. Glad someone else noticed how Michael Palin-ish Matt looks! :D I loved the guy instantly.